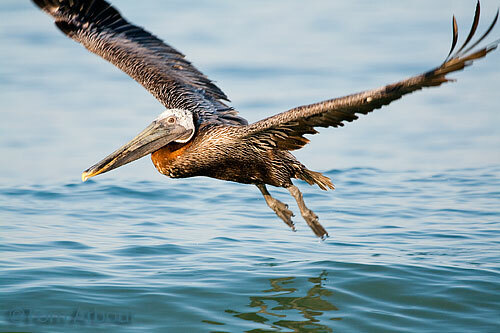 I've always thought that Brown Pelicans weren't all that interesting, but actually, they are really quite cool. They can look downright awkward from some angles, like they were sewn together by a crazy taxidermist, and from others, they are just really graceful, well put together birds. We were lucky to have a brown pelican and magnificent frigatebird roost on the property of our home for seven days in Rincon, Puerto Rico. Needless to say, these birds of the coast provided ample photographic opportunities. YES! Brown Pelicans are a trip. While paddling Turkey Creek in Fla, I enjoyed watching them splash land in the water. As I was heading back, I saw one mob, tease, or pester a dolphin. It looked as if the pelican was trying to land on the dolphin. Don't think I will ever tire of witnessing a squadron of them fly in. Not interesting? Our state bird? Them's fightin' words! *L* I'm glad you found a new appreciation for them, anyway. I love 'em. In breeding season they get some lovely color. Forgot to mention that they're also a conservation success story. They were almost GONE just a few decades ago. Kayaker- I need to get a Kayak and do some Kayaking. Any recommendations for some casual paddling around Ohio's streams and rivers? Also- very cool dolphin story. Those are the kinds of things that a kayak let's you see. I want one. Megan- Yah, they are simultaneously beautiful and ugly. Lana-I must say that the pelican is a great choice for a state bird. Our Cardinal doesn't really match it. And yes, it really is a conservation story. Just last November, the brown pelican was removed from the U.S. Endangered species list and is now considered "recovered by the USFWS"
Beautiful shot! Bet you have a wonderful vacation away from the snow. Every time I see a pelican I think they are so ungainly that I wonder how they work at all! Your photograph shows a grace, artistry and detail that I love. Mary- Thanks. Well, we did for a week, but we're back. Fortunately the snow is melting. Andree- Thanks very much. When they work, they really work. What a beautiful animal. I didn't know there was such a thing as a brown pelican! Thanks for sharing.